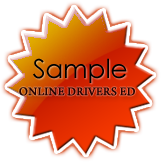 DMV Practice Test Online - Drivers Education Orange County, Teen and Adult Driving Training School. Review the California Driver Handbook. It contains a lot of information and it may take you a few days. Read the questions carefully. Do not try to read beyond what the question requires. There will be a correct answer and the other two answers will be obviously wrong or inadequate. Remember, all test questions are taken from the manual. If you take a question wrong, the employee of the local office can tell the page where you can find the correct answer. Do not be nervous. The DMV wants you to pass the exam. Good Luck!